In response to shortage in blood inventories, Hong Kong Red Cross Blood Transfusion Service would appeal to the general public for blood donation, such that clinical transfusion treatment would not be interrupted. 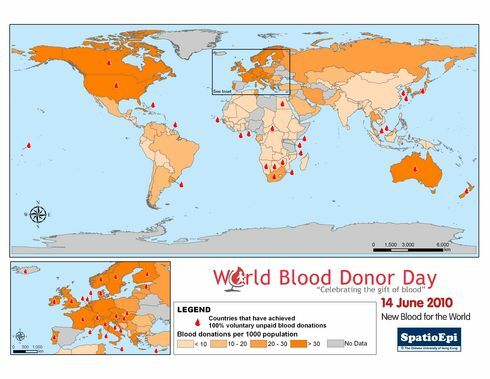 The map shows the increase in whole blood collections by donors’ residence districts and donor centres, after an urgent appeal for blood donation on 4th May this year. In the first week after the appeal, a significant increase in whole blood collections was observed in all 9 donor centres, indicated by blood drop symbols. As compared with the daily number of collections in the fortnight before the appeal, more than 50 collection units of whole blood were collected per day in Mong Kok Donor Centre. As depicted by graduated colour, the weekly number of blood donors in eight districts increased by more than 50%. 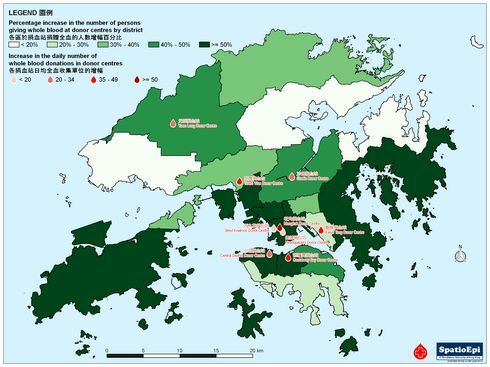 However, people residing in Tuen Mun, Tai Po, Kwun Tong and Southern were less responsive to the appeal. The geographical variation in responding to the appeal might be related to multiple factors, such as population structure, accessibility of donor centres and life-style and commuting patterns of residents. World Blood Donor Day is observed on 14th June. The slogan of the campaign this year not only encourages people to take immediate action to give blood, but also highlights the importance of regular blood donation on healthcare services. 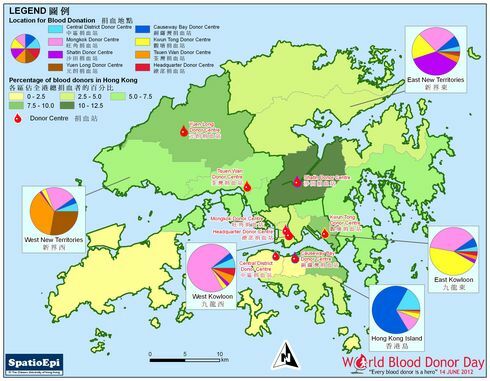 Data for the map were obtained from Hong Kong Red Cross Blood Transfusion Service. In Hong Kong, blood donation programme was first introduced by the Red Cross back in 1952. It is a voluntary and non-remunerated service operated through mobile units and donor centres. Since there is no substitution for blood, a large volume of regular blood donors is necessary to ensure self-sufficiency in blood supply in the territory. Giving blood is harmless to the donor. The whole donation process normally consumes only about 10 minutes, and only about 350ml to 450ml blood is taken from the donor each time. The blood collected is separated into various blood components including red blood cells, white cells, platelet and plasma, for different treatment purposes. ?